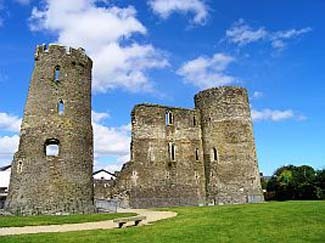 Ferns Castle was built in the 13th century and originally formed a square, with large corner towers but now just half of the castle remains. The most complete tower contains a circular chapel with carved ornament, several original fireplaces and a vaulted basement. The adjacent Visitors Centre contains the renowned Ferns Tapestry which depicts the story of Ferns in stitch work. Other historic sites in Ferns include St. Mary's, a 12th century Augustinian Priory; the remains of a 13th century cathedral, St. Peter's, a small nave and chancel church; and some High Crosses and parts of crosses, which stand in the cathedral grounds. Open daily 24th May - 26th September 10am-6pm.